Although “Burma: Rivers of Flavor” has dozens of recipes and plenty of instruction on ingredients and techniques, it is much more than a cookbook. Like Naomi Duguid’s earlier books, which were co-authored with Jeffrey Alford, this is also a travelogue, ethnography and photo gallery. An intrepid Canadian, Duguid has made repeated trips to Myanmar, also known as Burma, since 1980. Visiting much of the country, including seacoast, hills and delta, she has sampled a great array of local dishes and closely observed how they are prepared and served. 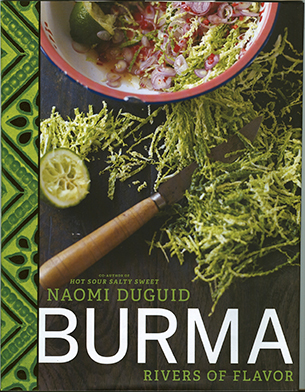 Naomi Duguid’s “Burma: Rivers of Flavor” is a cookbook, travelogue, ethnography and photo gallery. Duguid previously approached Myanmar’s borders in “Hot, Sour, Salty, Sweet,” which focuses on cuisines of the Mekong region, and in my favorite, “Beyond the Great Wall,” which includes China’s Yunnan Province. Her Indian subcontinent “Mangoes and Curry Leaves” contains the samosas and biriyanis also found in Myanmar. Since Duguid believes in presenting her recipes within social context, in “Burma: Rivers of Flavor” she often references Myanmar’s diverse ethnicity. The Kachins, she notes, only recently began cooking with oil, and northern Chins use corn porridge as their staple grain rather than rice. Several recipes have a Rakhine variation, adding galangal and more chili than central Myanmar versions. Shan State is well represented in this book, and Duguid notes that Shan cooks are very efficient, capable of making a meal using only one pot. Gaeng gai sai aloo, a one-pot Shan chicken curry with potatoes and lemongrass, was especially well received by my dinner guests when I followed her recipe, although it had much more broth than the picture showed (not a bad thing). Healthy turmeric, ginger and shallots are omnipresent in the recipes, along with the pungency of fish sauce, ngapi (fermented fish/shrimp paste) and balachaung (a dried shrimp and shallot condiment). Like a supportive auntie, Duguid reassures first-timers with “don’t be intimidated.” Useful instructions are provided to not-from-Myanmar readers for frying crispy sliced shallots (a skill I have now mastered, thanks to her step-by-step) and preparing “Shan tofu” from chickpea flour. Experienced Southeast Asian cooks can learn to make their own tua nao (soybean disks) or sweet moun lon yei bo (“magic rice balls”). Duguid has a down-to-earth approach to cuisine, and her culinary choices mostly come from humble street stalls and bus stop restaurants. Home cooking is also important—she gives special credit to local cooks Daw Mya Mya in the central Myanmar town of Pakokku; Daw Cho Cho in Taung Be, near the ancient city of Bagan; and Daw Shwe Nwe in Mrauk U.
Enticing photos show many of the prepared recipes presented in shabby chic style on chipped enamelware and faded china plates. The tone throughout is appropriately thrifty, as Duguid advises reusing oil, not wasting fruit and cutting whole chickens into small pieces. The recipes are her personal selections rather than a comprehensive “Joy of Cooking” for Myanmar—sadly there’s no pork curry, and readers from Myanmar will certainly notice other omissions. But for overseas cooks, this is a very valuable resource, and even readers in Myanmar’s central cities can find some intriguing new tastes, like the Tavoyan fish soup or Kachin beef with herbs and spices pounded into it. I would suggest inviting a group of friends to a meal using the Kachin recipes in the book and charging them a fundraising fee to benefit Kachins internally displaced by the current war in the north. In the interspersed travel recollections, Duguid writes affectingly and unpretentiously about her encounters with ordinary working people. A man she calls Sai took her on a motorcycle tour of food-related cottage industries around Hsipaw in Shan State, including a peanut oil press, salt wells and a small cane-sugar processor, all traditional ways of using local materials. She emphasizes that in the nation’s darkest hours, food has often been a source of comfort. This book should serve as a timely reminder of the ongoing need for integrity in food: Myanmar must not surrender to international agribusiness plantations pushing out local sustainability, environmentally damaging and unhealthy palm oil as a substitute for traditional peanut oil, the use of MSG instead of ngapi, or fast-food chain restaurants replacing quickly prepared fresh street food.